Green tomatoes, roasted garlic, and ground beef make a colorful and flavorful chili recipe perfect for fall. You can make this in the Instant Pot®, a slow cooker, or on the stovetop. As someone who cooks with what's in season, this time of year means green tomatoes. I decided to update an old post from my first year, really the first few weeks of starting this website. 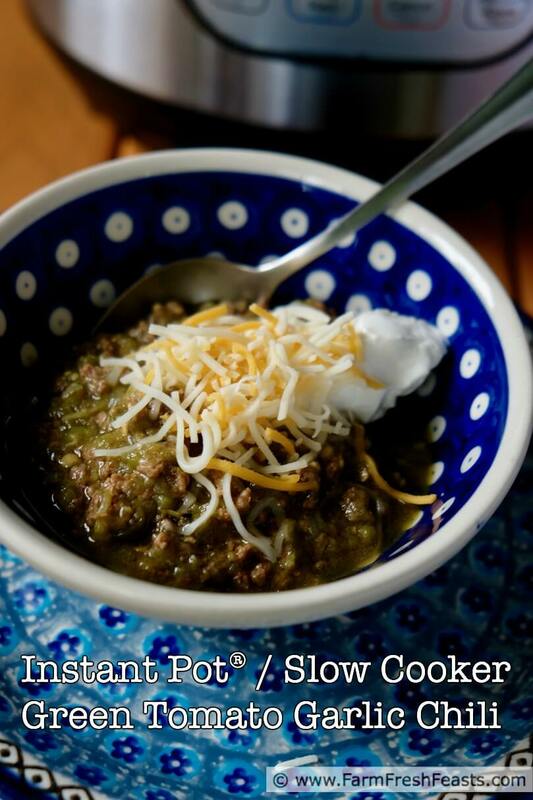 In addition to publishing new photos and adding an easier to read recipe card, I've also cooked this recipe in my newest appliance, the Instant Pot®. My husband bought me an early birthday/Christmas present, and I unboxed it--with the dogs' help--and shared the resulting video on my FB page. I'm quite happy to ditch the old, poor quality photos for some newer, still poor quality photos (it's been raining here), but I didn't want to delete how I was inspired to make this chili. For that, please feel free to read my original text below. I recently started volunteering at a thrift shop. I didn't realize that it would mean I'd be shopping at the thrift shop on a regular basis, which is an unfortunate happy side effect. I mean, I did get a pair of new-to-me jeans for $3. And they're not 'mom jeans' either. Last time I volunteered was after I'd made the Cabin Casserole. I was chatting with Fran about it, and how the recipe called for green tomatoes, when she told me about her Green Tomato Garlic Chili. I immediately requested the recipe! This recipe is from The Garlic Lover's Cookbook. I've adapted Fran's recipe by cutting the fat, adjusting the spices, swapping roasted for fresh garlic, pumping up the amount of veggies, and finely chopping everything so my kids will eat it. We liked it so much that I harvested the rest of the green tomatoes on my plants, cored them (the composting pigs like green tomatoes too!) pulsed them in my lovely food processor, and froze 2 2+ lb bags of green tomatoes for winter chili nights. Make that chilly winter nights. Oooh! I used ground beef, but feel free to substitute fresh ground pork. 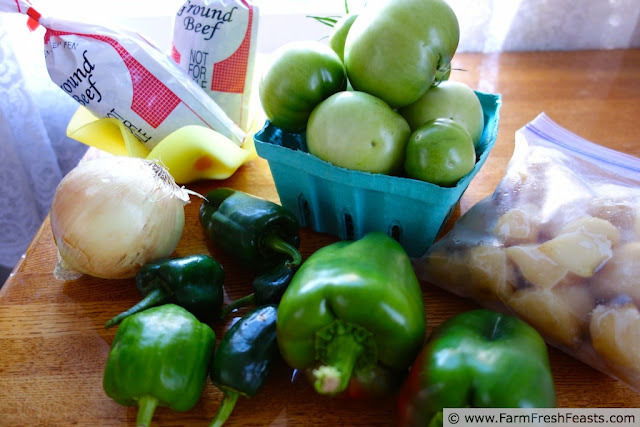 I already know ground pork and green tomatoes make a great chili--check out my Chorizo & Green Tomato Chili recipe here. Use the hot peppers of your choice. I'm able to get quarts of freshly roasted Hatch chiles each August from the local grocery store, and I pop them into the freezer to use throughout the year. I think using roasted chiles adds more flavor than fresh chiles, so I do recommend using roasted green chiles. No roasted garlic? No problem! You can substitute minced garlic, probably ⅓ of a cup. Like with the chiles, I think that using roasted garlic punches up the flavor in many dishes. When I harvest my garlic crop each summer, I roast and freeze a portion for use throughout the year. Here's a post about how I put up my garlic crop. I've included instructions for cooking this chili in an Instant Pot® (mine is 6 quarts, plenty of room), in a slow cooker, and on the stove top. I am sure you could figure out a way to cook this on a grill--but I'm not going to do that. I grill pizza and vegetables mostly, and I'm good with that. Watch the video to see how I made this recipe! I taught myself how to do split screen so I could show the Instant Pot® control panel as well as what the food looks like. All our phones are out of storage and the batteries are nearly empty--but I did manage to show what I was trying to share. Now gather your ingredients and get started! Nothing fancy here--just meat and vegetables, with spices and broth, and that means that this chili is gluten and dairy free. My late grandmas would recognize much of these--but they lived in Canada and Wisconsin so the chiles would probably be something unusual for them. Good ingredients mean good flavor, and local is best in my opinion! 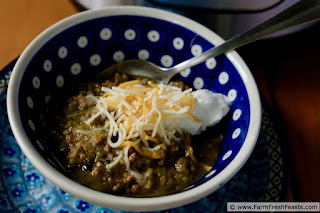 Green tomatoes, roasted garlic and ground beef makes a colorful and flavorful chili recipe. You can make this in the Instant Pot®, a slow cooker, or on the stovetop. 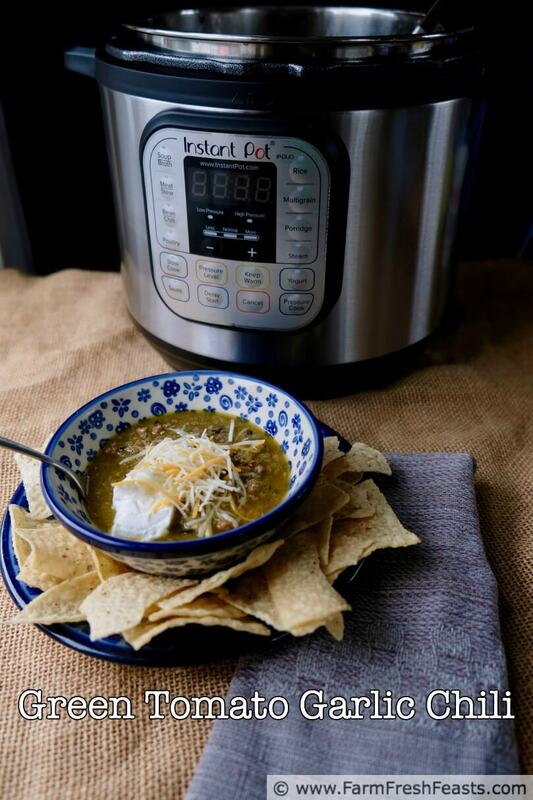 Times shown refer to the Instant Pot® and include the time it took to achieve pressure and to depressurize. To make this chili in an Instant Pot®, set the Sauté function to More heat for 10 minutes. Add a teaspoon of oil then the ground beef. Cook until about halfway browned. Stir in the onion and bell pepper, and cook until the vegetables are softened and the meat is browned. Add the rest of the ingredients, stir, and lock the lid onto the pot. Turn the steam release handle to Sealing. Set the Pressure Cook function for High pressure, and adjust the time to 20 minutes. When the cooking cycle has finished, carefully turn the steam release valve to Venting. When the float valve has dropped, open the lid. If you're serving your chili over noodles, you're good to go. If you'd prefer a thicker chili, set the Sauté function to More Heat for 10 minutes, and stir occasionally until the chili is thickened. To make this chili in a slow cooker, brown ground beef in oil in a large skillet over medium heat, adding onion and pepper halfway thru the cooking time. Stir in roasted garlic until thoroughly combined. 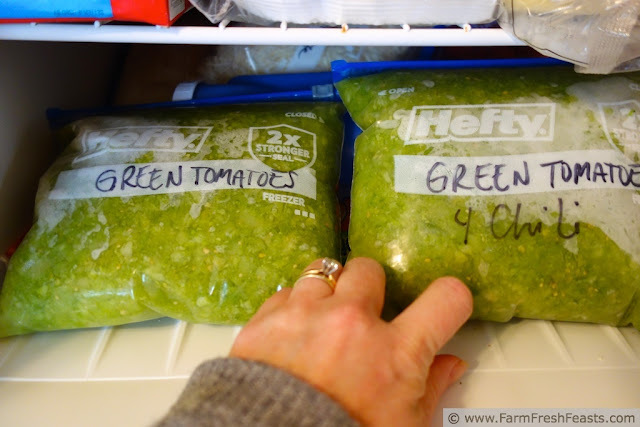 Transfer to a 3.5 quart or larger slow cooker, and stir in the chiles, spices, and tomatoes. You'll only need ½ cup of broth if your tomatoes are watery, use the full cup if they are firmer. Cover and cook on Low for 6-8 hours, or High for 3-4 hours. Serve as above. To make this chili on the stovetop, heat a heavy bottomed pot (that's at least 3 quarts and has a lid) over medium high heat, add oil. Drop in the ground beef, and stir to break up clumps into small pieces. Sauté until starting to brown, then add the onions and bell peppers. Cook until vegetables are softened, about 10 minutes. Add remaining ingredients to the pan and stir to combine. Cover and bring to a boil. When you see the broth bubbling throughout the surface of the pot, reduce heat to medium and simmer for 30 minutes, stirring every 5-10 minutes or so. Remove lid, and continue simmering for another 10-15 minutes until desired consistency is reached. Yes, you can freeze chopped green tomatoes, or water bath can them, to make this chili throughout the year. hey now - i am a firm believer that mom jeans are going to make a come back. that being said, i think we'll all have to be a size baby-from-dirty-dancing to make 'em work. I could happily never wear mom jeans again. The only slightly mom-ish jeans I will wear are the ones from my pre-mom days, and that's only when I am gardening and my primary sturdy outdoor pants are in the wash. Thanks for stopping by! I'm so glad to hear it--thanks for taking time to let me know! Love all the garlic and I never thought to use green tomatoes this way, Kirsten. Thanks for sharing at Foodie Friends Friday! Who knew that green tomatoes were such an versatile ingredient?! It's easy to roast Poblano peppers. I put mine in a cast iron skillet, covered, on very low heat (2 on an electric stove, and as low as the gas will go on a gas stove), and leave them for a long time - sorry, I never time it. I just check on them now and then, and turn them as needed. They soften up nicely in the process. I leave them longer after I turn the heat off, and they steam under the lid, so by the time I take them out to peel them, they're just right. You have to check on them more frequently with gas stoves, as they'll burn faster. It's fine to have a bit of black on each side, as the skin will get peeled off. Thanks for the tip! I bypassed poblanos in the 'take as many peppers as you want' bin while picking up my CSA farm share today (grabbed a couple jalapeños instead) but I'll try this next week. I think I missed the steaming part. Nothing like a good chili on a cold winter's day too! You're right--chili is terrific in cold weather. I never made it while we lived in Hawaii. Just didn't ever seem like chili weather. Thanks! Do I have to put the tomatoes through the food processor or can I just chop them up? Should I de-seed them? I'm sorry for the delay in responding to your comment. I'm having trouble with actual comments being flagged as spam. I'm working to correct that. You can easily just chop the tomatoes up on a cutting board. I wouldn't stress over de-seeding them, but I'd scrape all of the seeds left on the cutting board into the compost bucket and not add them to the recipe. Do I have to put the tomatoes through the food processor and de-seed or do I just chop them up and throw them in? See above--and thanks for stopping by!